There's no secrets in the fact I love make up, I happened to be nose-ying around on Twitter when the lovely Caz posted a pic of a plaque she had made it was WOW I fell in love, so I asked her for more deets, that's when she pointed me in the direction of Stacie Sparkle. I've been excited to share this weeks tag with you as there is some AMAZING looks! We totally rocked this theme :D Just as my lil man recovered after 2 weeks of teething his first two weeks hes now teething again and really poorly so I didn't get to do a good job with mine :( But each time you girls sent me your emails I got more and more excited theres some serious talent this week so well done girls. I know you guys will think I'm totally crazy for buying this colour and I also know a lot of you aren't fond of it either but I decided to take the leap and buy it. yes it is very pale but I guess it depends on how well you can pull it off. The reason I bought it was to mix with other lipstick colours which I've been doing a lot of recently. To me the colour looks like a pale lavender if that even makes sense lol. I won't lie I have worn it on its own, not sure if I will brave it outside on its own though lets see maybe in the summer I might do so. Plus the full retail price excluding VAT on the Viva Glam lipsticks go to MAC Aids Fund which I think is pretty generous of MAC. MAC Strobe Cream has become a staple in my makeup routine. 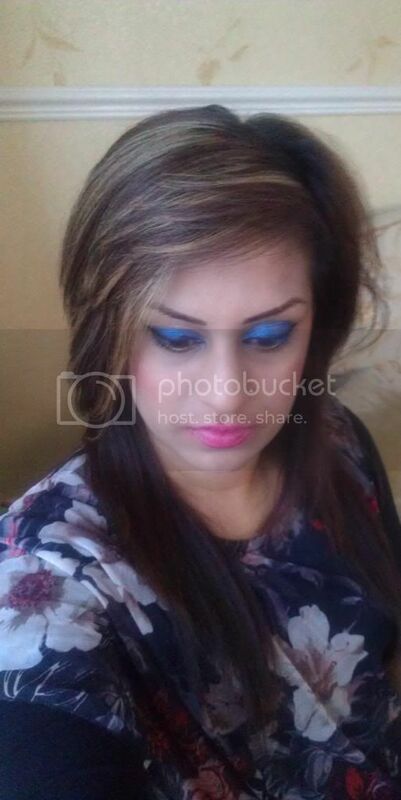 I searched high and low for a foundation to give me the glowing yet dewy look. I mean I have about 8 foundations piled up in search for the right one including Nars Sheer Glow and unfortunately for me it didn't give me the dewy look, I do like it but it hasn't done it's purpose for me. That's when I did some googling and researching that's when I came across MAC Strobe Cream. It is such a versatile product, I can't express how impressed I am with it. It retails at £22.50 or you can get a travel size for £12.50. This is also available in a liquid form although if I'm honest I'm not sure of why it is available in two different forms. I use this as a highlighter but the best thing is I mix a small amount with my foundation in that case ANY foundation and it works its wonders. I did try capture a pic for you but unfortunately it wasn't showing up well. 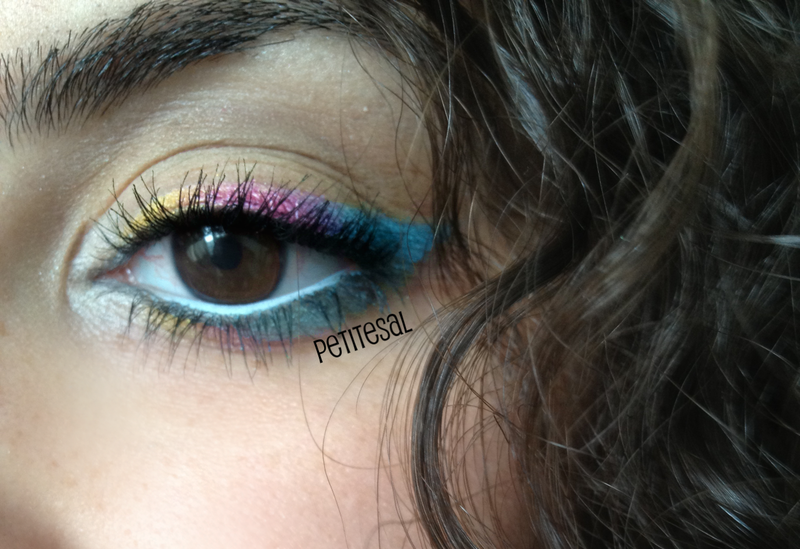 It comes in the consistency of a cream and once spread it has a pearlescent pink tone to it. 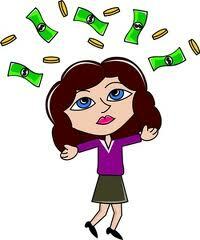 We are currently recruiting Co-Hosts if you would like to join us as one give Sarah an email. 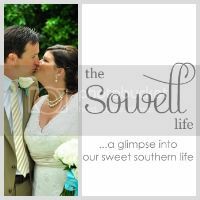 This week's Featured Blogger is: Joy from The Sowell Life. At first I wasn't too keen on this palette I preferred my Glinda palette see my review on the Glinda palette *here* but if I'm honest its grew on me i totally looked the opposite way with this palette until I swatched it, must I say the colours are more useable for natural eyes which I seem to be doing more of these days. So yeah it has grown on me but out of the two its Glinda I still really love. I would definitely urge you to swatch these before making your mind up as colour pay off, pigmentation and the mixture of textures i.e. 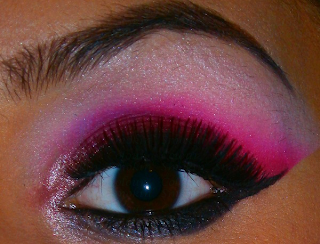 glitter, matte, shimmer is amazing. I won't bore you about the packaging as I've already told you on my Glinda review I love it. 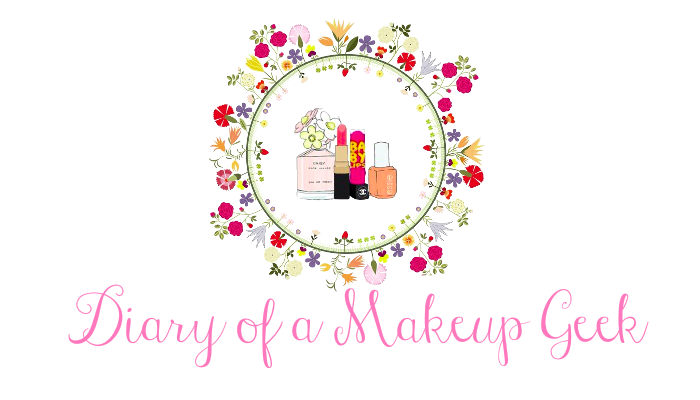 Welcome to my 10th Northern Beauty Blogs Blog Hop. This hop will be Open from Tuesday 19th March 2013 for 1 week. Hey peeps, I'm co-hosting the 'Share the love blog hop' the blogging community is awesome so this is an amazing way of showing more love and discovering new blogs. 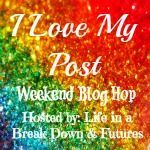 I love the whole conception of blog hops and think they are an amazing idea. Welcome to my 8th Northern Beauty Blogs Blog Hop. This hop will be Open from Tuesday 19th February 2013 for 1 week. Hey peeps hope you are all well just a quick message I may possibly be removing GFC I know its not been announced as going but there is lots of misconception about it all which has effected everyone so I will now be concentrating on Bloglovin followers. Please follow me VIA Bloglovin the button to connect is on my sidebar on the right-hand side also leave me your Bloglovin links as I want to make sure I'm following you all on there. 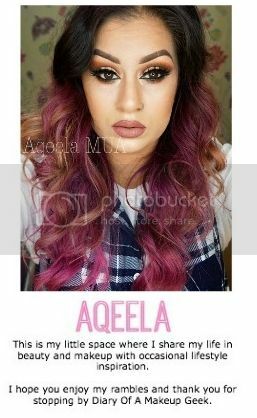 I have also added the She Said Beauty widget and again please follow me VIA there and leave me links. Finally be sure to share some love by adding your links to the blog hop on yesterdays post. DGJ Organics are a brand that specialise in organic hair care. I have previously reviewed some of their items too click *here* to see my previous review and what I thought. I loved their 'Hangover' range and the 'Hair Juice' conditioner too it smells lush. Anyway I have seen lots of reviews and good things about their 'Berutti Oil' so when I tweeted them about this they kindly sent me the oil. I love hair oils I currently use two; pure Olive Oil which I massage into my hair and leave in for atleast a few hours if not overnight before washing out, the second oil I use is Mythic Oil which I use in damp hair to keep my ends nourished. This oil is to be used more like the Mythic Oil. This retails at £7.99 for 150ml and has a thicker consistency to normal hair oils but this doesn't at all weigh my hair down nor leave it greasy. It contains 'Organic Argan Oil to help nourish and restore healthy hair' which is another plus point. I quite like the packaging too simple but effective, the bottle itself has a pump which means no mess which can happen wuite easily with oils. It is doing really well at taming my ends and keeping them detangled and must I mention I quite like the smell, I was a little on the fence about the smell but I've grown to love it. Have you tried anything from the DGJ Organic range? Did you know they also do a kids range too. Didn't know what to call this post hence the title yesterday I was confused but since researching about and reading the lovely Sal's post click *here* to have a read. I however have installed Bloglovin (Follow my blog with Bloglovin) as a back up which I think it is only sensible to do so. So if Google Reader is going and GFC is not how do you manage blogs? Well simply by keeping up to them through your Blogger Dashboard (Blogger.com) this is different to Google Reader. I've also become aware that there is a petition gong round to stop Google Reader going although it is worth signing it click *here* if you wish to do so. I hope this cleared things up a little for you all let know of any updates too. Is It Time To Say Goodbye GFC?! This post is going to be vague but is very important, seeing that Google reader is going most likely will GFC go too unless Google bring a new platform which connects to GFC I mean can they really get rid of GFC that is one of their main features on Blogger so it seems really bizarre .. Why would they want to loose/let down their users? But hey if that's the case and that's what they are going to do then there is nothing we can do .. So the meaning of this post, I know what it's like to follow my fav blogs and keep upto date with their posts I mean that's what you do as a dedicated follower right? My urge to my followers is please follow my blog via Bloglovin another platform which is an easy way to keep up with blogs and also arrange an alternative for your own blogs too we have two months to prepare for the change. Obviously GFC is more than just numbers and followers but more so support and motivation. Thanks a lot peeps hope you found this post helpful and I wouldn't like to lose the support I have. Hey peeps its that time again I really wasn't going to take part this week lil man is teething and has a virus so he's mega ill which means I've had the very minimum sleep for the last 10 days and I'm ill too but hey I pushed myself to do it. I'm so sorry I haven't been sending out reminders which is probs why not many have took part this week. I've been so ill I felt like cancelling the whole tag but thought I'd be letting you all down so here it is. We are all aware of how many high end brands are making appearances in TK Max one of them is Bellapiere. I was first introduced to Bellapiere when I was on one of my mad shopping spree's around Glasgow Central. The lady introduced and demonstrated on me their mineral foundation which consists of only 3 ingredients. I bought both the mineral foundation and mineral blush which I can happily say I am happy with til date. It wears so lightly and has brilliant coverage while letting your skin breathe. 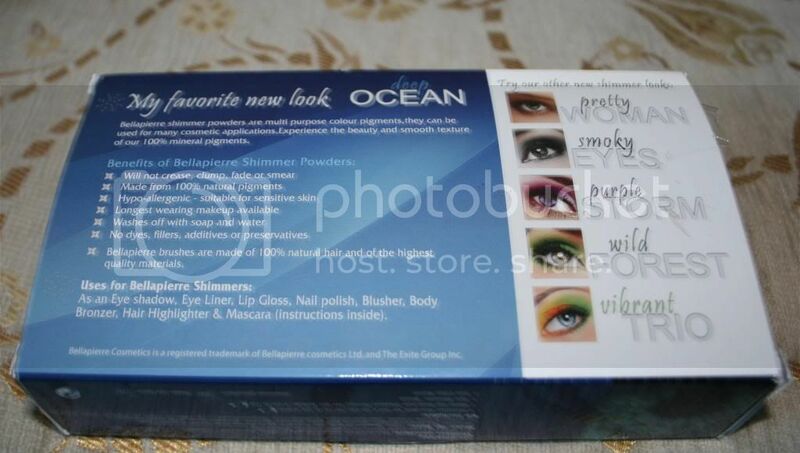 Anyway my sister picked up a Deep Ocean mineral eyeshadow set from TK Max there is also 4 other sets available but were not in TK Max, this retails at £39.99 but my sis picked it up for £10.00. 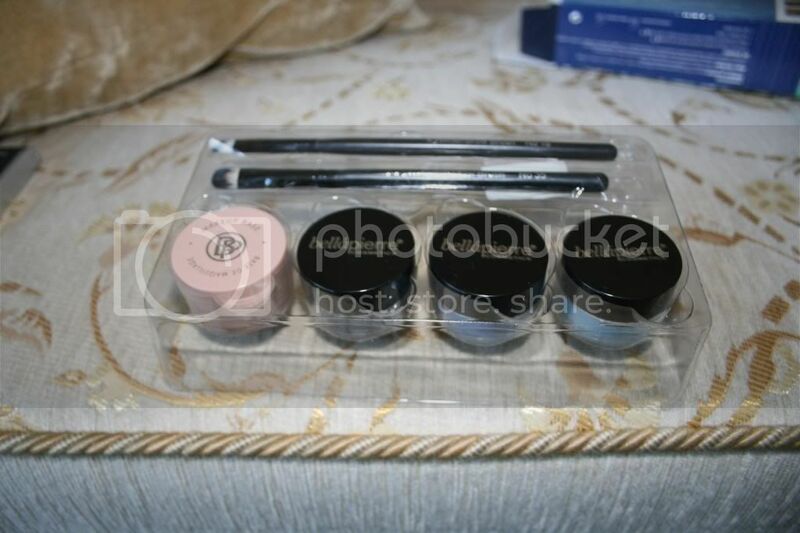 The set contains 2 brushes of fairly good quality, 3 mineral eyeshadows and a base. 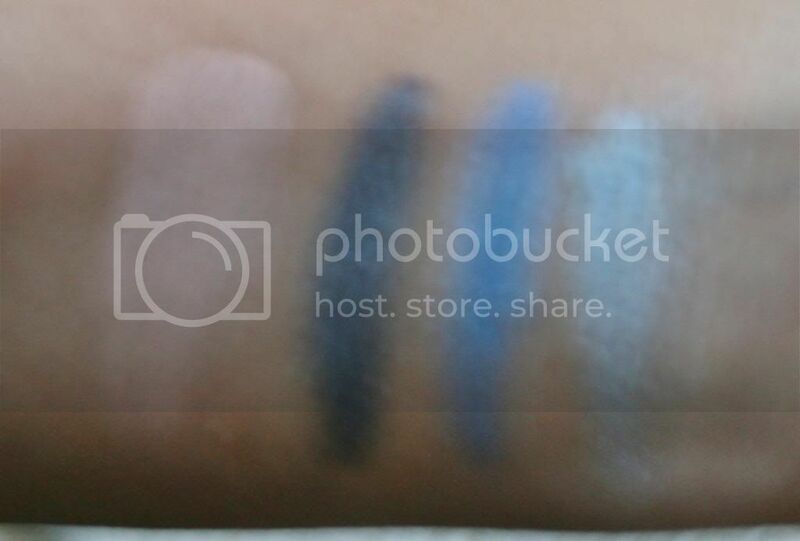 Although I've swatched the eyeshadows I couldn't catch a decent pic of the swatches so I've included a pic of me wearing one of the eye shadows. Have you tried any of the Bellepiere products? Hey, today is another skin care post featuring Tropic Skin Care. Recently they were looking for people to review their range and as I'm learning more about skin care I've been loving affordable Organic companies one of them which is Tropic Skin Care. I chose to review their Organic Elixir Oil this is basically a face oil which has Rosehip & Moringa to nourish and tighten skin. I'll pre-warn you this will be a lengthy post. Hey just a quick post I've recently had my my nails done with acrylics. I used to get them done every month when I was working and commitment free but since moving towns I just couldn't get round to getting them done. After roughly two years I finally had them done I was skeptical and on two mind with me having my lil man but I'm managing fine. Hey peeps! Yes I'm late with this one as usual better late than never eh lol ... ok ok lets get on with it. To reach a 100 followers was a dream I didn't ever think I would reach 500! I didn't get chance to hold one at 400 followers as my 300 followers giveaway was running at the time and I didn't want to have two running, infact I hit the 500 mark then too hence why this one is going up late. I did a little mix up with this one there will be three winners one for each prize. This is a international giveaway so anyone can enter. Another item which was longly waited for to be released not just by me but the half of Twitter lol! More people tend to have been wanting the Theodora palette as its more dark neautrals whereas for me I wanted both but chose this one. Product/packaging is gorgeously designed and anticipated after Disney's Wizard of Oz. As usual Urban Decay have bought out unique packaging like they do with the rest of their palettes which I seem to love and have a collection of . What you get - Not only do you get the palette, you get the eyeshadows along with it including two duo eyeshadows, eyeliner pencil in 'Rock Star', lip colour and a 'get the look sheet'.